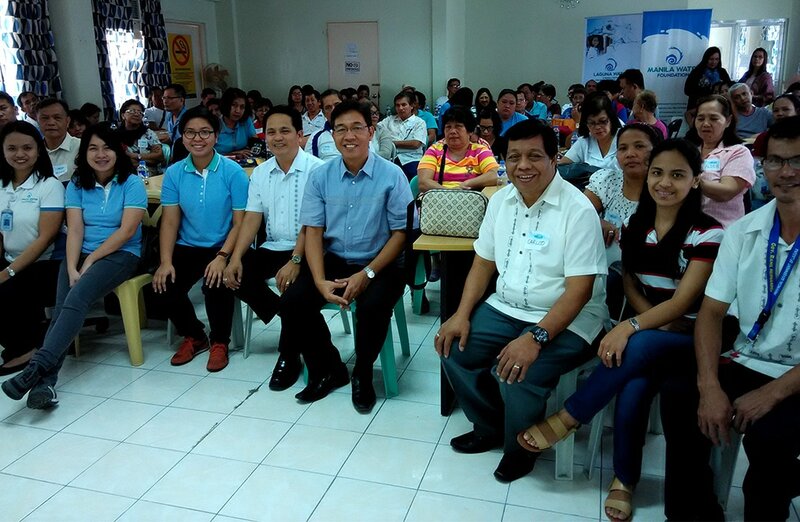 KPSB partner cooperatives in Laguna were made ready for possible ventures into new businesses. In this photo are (L-R) Laguna Water Company Sustainability and Development Manager Eunice Ricaforte, MWF Progam Officer for KPSB Krishna Tessa Absin, MWF Program Manager for KPSB Carmela Rosal, Laguna PCDO Asst. Head Noli Balboa, Laguna PCDO Head Edwin Bautista, PCDO Trainer Carlito Esmas. To further engage and encourage its Kabuhayan Para sa Barangay (KPSB) partner cooperatives from Laguna and Bataan to take concrete actions towards community-based development, Manila Water Foundation (MWF) recently took part in several capacity-building trainings, which were initiated by Laguna Water Company and Manila Water Philippine Ventures. With the support of Laguna Provincial Cooperative Development Office (PCDO) and the Bataan Provincial Cooperative and Enterprise Development Office (PCEDO), over 60 KPSB partner cooperatives composed of close to 200 members were enjoined to attend the Entrepreneurship and Business Management and Resiliency seminars in the mentioned provinces. Led by a Cooperative Development Authority accredited trainer, these seminars were conducted to improve the participants’ marketing and management skills to enable them to develop business resiliency abilities that will help them combat and rise above the challenges they face as an organization. These objectives were supported by Bataan PCEDO Head Azucena Sugatain, who further encouraged the cooperatives to venture into new businesses. On the other hand, Laguna Provincial Administrator Atty. Dulce Rebanal expressed her appreciation towards the Foundation for its unending support for the cooperatives, which started with the KPSB program’s zero-interest loans. The KPSB program comprises the community assistance and livelihood focus area of MWF. To date, it has opened its doors of opportunities to 464 cooperatives all over the country.